Another Quest is a vertical roguelike available on Android. 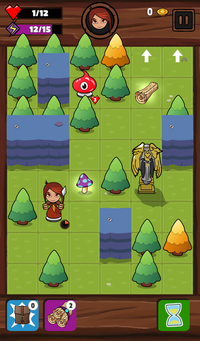 The game is designed to be played in portrait mode on mobile systems. Another Quest is inspired by classical roguelikes. The game has permadeath, is turn-based and grid-based and the levels are randomly generated. One key difference with the genre is the exploration which is essentially vertical. You must go to the white arrows. The NPC are similar to the player: they have an inventory, can use items and spells, etc. The exploration is essentially vertical. You must reach the top line of the grid to go to the next stage. This feature helps to play in portrait mode. The game is item-based: there is no form of character advancement other than getting items and upgrading them. Items have a level instead of the player. The player can find runes to upgrade his items. A boss on the top shelf. Each game, you must defeat all the bosses present on the top-shelf to win. When you win a game, you earn diamonds that you can spend to unlock boxes to add more content to the game. 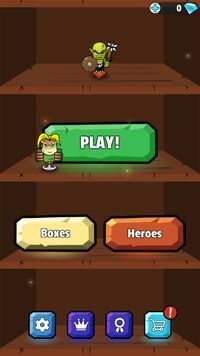 Another Quest uses a boxes system to progressively add content to the game. The small boxes add few new NPC, loots and elements. The big boxes add loots and NPC to the game but also unlock a new hero, a new boss and a new environment (forest, village, mine, etc.). This page was last modified on 4 April 2019, at 15:27.